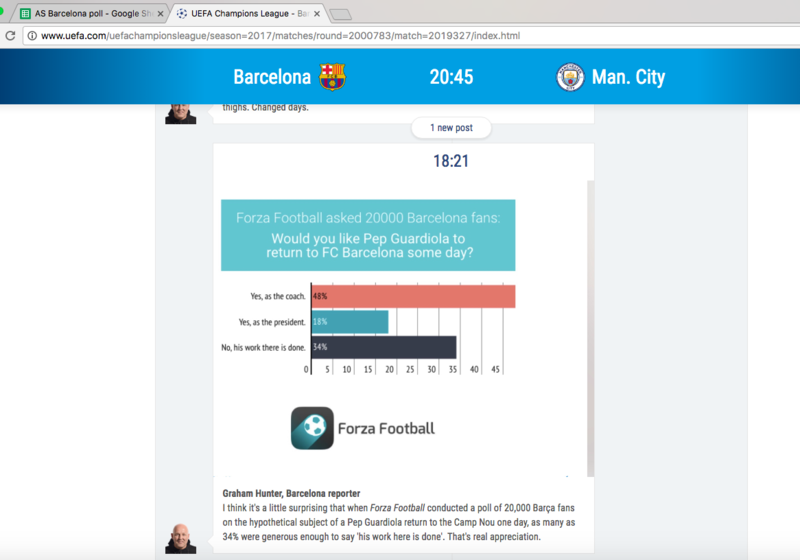 Ahead of the game Barcelona-Manchester City in the Champions League we conducted a poll among Barça fans around the Globe. The Spanish newspaper AS were curious to find out if the "culés" would like Pep Guardiola to return to the club one day. And we could help them to find out. 67% answered yes, that the Catalan is welcome back. 46% would like Guardiola to return as coach while 21% would like to see him as the president. A lot of British newspapers (The Telegraph, Independent, The Mirror, The Daily Mail) picked up the poll result in their live reports during the game. We are happy that some media outlets out there choose to listen to the fans and report their opinions. Of course we conduct the polls free of charge, if anyone wondered.